Susan Anderson is interviewed by Drs. Gloria and Heidi Horsley for The Open to Hope foundation radio show. Anderson has extensive personal experience with loss and works as a psychotherapist helping others address their own grief hurdles. She’s also a speaker and author, as well as the founder of the Abandonment Recovery Movement. “Abandonment issues are primal feelings of loss from childhood,” Anderson explains. It’s that same feeling of “mommy’s not coming back to the crib” that people never really outgrow. Losing a loved one can definitely feel like abandonment at the primal level. When Anderson was married for 18 years, her husband “up and left me literally out of the blue.” She moved into what she calls “abandonment grief,” which was crippling. Although she didn’t lose her husband in death, she thought at the time that would have been easier. “It’s that feeling of being deserted” she says. 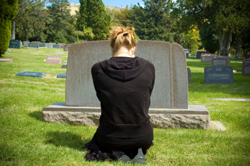 A death of a marriage can be compared to other types of deaths in many cases. Losing someone to death is one type of loss. However, especially in The Digital Era, you literally watch someone move on without you. It’s as if you’ve lost someone like they’ve died, but the rest of the world hasn’t. “It’s like a death, but it’s different,” she says. She recovered from the abandonment, got into a new and great relationship, but lost that relationship nine years later to death. She experienced the death of a marriage and a traditional death. Her second husband died of cancer after a year of Anderson caring for him. These two losses have skyrocketed her towards a career in abandonment grief counseling where she helps others in like situations address their own hurdles in these unique losses.